France and Russia will coordinate the actions of its forces, fighting Islamic State militants in Syria, in order to avoid any confrontations, French defense minister, Jean-Yves Le Drian, said after talks with Russian counterpart, Sergey Shoigu, in Moscow. The two ministers agreed to hold similar bilateral meetings “on a regularly basis,” he added. The French minister assured that there’s no strife between the US-led coalition, of which France is a member, and the Russian forces in Syria. "There are no conflicts between us,” he stressed, reminding of the Russia-US deconfliction memorandum and mechanisms implemented after the arrival of French aircraft carrier, the Charles de Gaulle, off the Syrian coast. "In Syria, we [France] are making some progress, we hit Islamic State (IS, formerly ISIS/ISIL) regularly – by ourselves or with the US assistance. Russia is also fighting IS, so we’re moving forward," Le Drian said. He stressed that Paris isn’t trying to become a mediator between Moscow and Washington in creating a joint anti-IS coalition in Syria. The French minister also said that no military and technical cooperation deals were discussed between the sides after France failed to fulfill the contract to supply Russia with two Mistral helicopter carriers earlier this year. Le Drian said that the atmosphere at the meeting was “very friendly” and that he had a “very positive feeling” after talking to Shoigu. “Sergey Shoigu stressed that only by joining the efforts of all the concerned nations, one can eliminate the terrorist threat to the people of Paris, Moscow, London and other European cities,” it said. 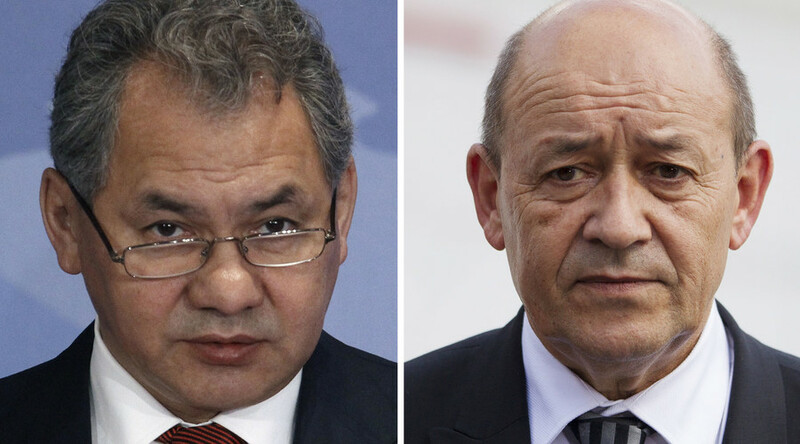 According to the Defense Ministry, Shoigu and Le Drian also discussed the situation in Libya. The Russian and French ministers “noted the similarity in views on the situation in the country and expressed concern about the intensification of Islamic State in the North African region,” the statement said. The French military has been carrying out anti-IS strikes as part of the US-led coalition. After 130 people were killed in Islamic State terrorist attacks in Paris on November 13, France deployed its aircraft carrier, the Charles de Gaulle, off Syria's coast, complete with 26 bomber jets on board and intensified its airstrikes against IS. President Vladimir Putin has ordered the Russian military to work together with the French forces and treat them like allies. Moscow has been bombing the terrorists since September 30, with Russian warplanes performing dozens of sorties every day at the request of Syrian President Bashar Assad.